Chronic egg can be a major issue with some parrot species, it is something every parrot owner should at least be aware of. By making a few small adjustments in the environment, owners can greatly reduce the chance of this issue occurring. First off I want to make sure that everyone understands that even if you have only one parrot that you share you life with, she can still lay eggs. This is more common in some species of parrots than others. Cockatiels seem particularly prone to chronic egg laying. I also know many folks with Cockatoos that have to deal with this every season. This can be a very serious issue and as Caregivers we need to be doing all we can to help ease and/or prevent this as much as possible. Egg laying can sometimes lead to calcium deficiency and egg binding, where the bird is unable to pass the egg because the shell is too soft. Both can be very dangerous situations for the hen and can lead to death in some cases. During their hormonal seasons it is really important to make sure you are supplementing their diets with calcium rich foods so that if they do lay and egg, their bodies have enough calcium to properly form the shell and not deplete it from their bones. Never offer supplements that are not prescribed by your Avian Vet. It is very important to understand how we as caregivers can help prevent chronic egg laying in Feathered Angels. There are conditions that stimulate a parrot into “breeding desires” and thus her body will start the egg production. These include the length of day, rainfall, and the availability of certain foods. When a bird goes into breeding condition, hormones are released that start the cycle of producing and laying eggs. As their caregivers it is up to us to know their hormonal cycles and then do things that help curb them. You want to decrease their amount of daylight. All parrots should get 12 hours of uninterrupted sleep each night, during hormonal seasons it is best to increase this to 13 or 14 hours of sleep time. Longer days stimulate the desire to procreate. You can also decrease the amount of fresh foods given on a daily basis. Reduce the numbers of showers or baths per week. Since their breeding seasons in the wild are linked to the months in the year where these things are the most prevalent, by reducing these things, it will help to decrease hormonal desires. Another good tactic to use, is moving the cage on a regular basis. Changing up positions of toys and changing out the toys every few days. Never leave nesting material in the cages or play areas. While it is important for parrots to have lots of things to chew up and shred, you want to remove and clean this up daily, so not to further encourage the thought of nesting. Do not play with your Angels under blankets or allow them to snuggle up in your clothing. This again will stimulate thoughts and desires of mating. Do not give your parrots small boxes or allow them to play in small dark areas, they will conceive these areas as nesting boxes. As caregivers we also need to be very aware of how we are handling and touching our birds all through the year. In the wild, birds only touch each others bodies when they are courting. As caregivers when we cuddle up our birds and stroke their backs and under their wings, we are truly sending them very mixed and confusing signals. This can lead to hormones flaring and frustrating our Feathered Angels into very aggressive behaviors. Petting our parrots should always remain on the head and neck area only. I realize that we need to examine their bodies regularly, but keep it quick and without stroking. Sometimes even with practicing all these preventative methods, some parrots will still lay eggs. In cases like that, you need to speak with your Avian Vet on ways to help with possibly medical intervention by giving hormone shots. Should your Parrot lay and egg, I feel it is best to leave it in place for as long as possible, or to remove it and replace it with fake eggs. The reason for this, it that some birds will continue to produce eggs in order to replace the missing ones. I just tend to feel it is better to play it safe and allow the parrot to believe her egg(s) are still there. 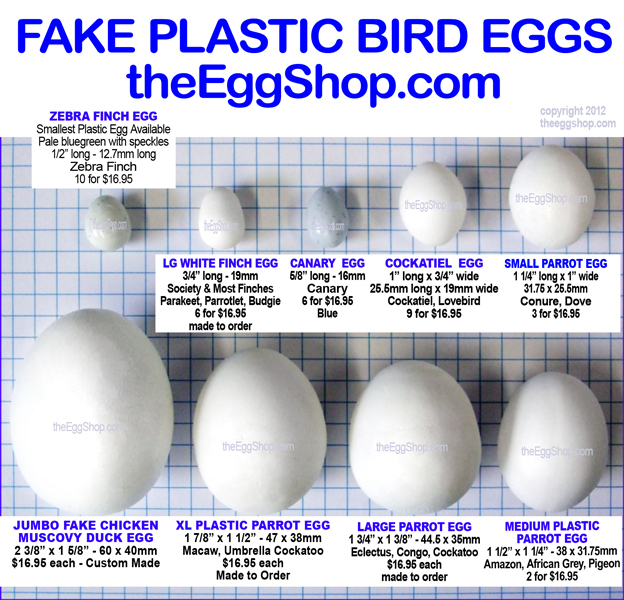 I have provided a link of one place that sells fake eggs for this very purpose. They have them made according to species size and shape. Always check with your own Avian Vet first and follow their instructions. These are my own thoughts, opinions and ideas based on my personal experiences with my Feathered Angels.